Nick Read and Mark Franchetti's documentary Bolshoi Babylon airs on HBO on Monday, December 21. Nick Read and Mark Franchetti were in Russia in the winter of 2013 looking to make their first documentary film about a prisoner accused of murder in the northern reaches of the country. But while there they got the call that another, perhaps more explosive, story had just broken thousands of miles south: an acid attack on Sergei Filin, the artistic director of the Bolshoi Ballet. Franchetti, the Moscow-based correspondent for London’s The Sunday Times, and Read, an award-winning British cinematographer and director who had previously covered the war in Iraq and the 1989 Velvet Revolution in Czechoslovakia, wasted no time in shifting gears. While neither at that time was a dance fan, both could see that an act of barbarism inflicted on the seemingly beautiful world of the ballet was itself a compelling blood-and-guts story. Once in Moscow, they got permission to bring their cameras inside the famed 250-year old theatre and started interviewing subjects for a new documentary that ended up taking them close to a year to complete. Bolshoi Babylon, which screens on HBO on Dec. 21, goes behind the scenes of one of the world’s most famous classical dance companies to show the dark side of an art form that most people think of as light, airy and divorced from reality. Nothing could be further from the truth. Taking the acid attack on Sergei Filin as its starting point, Bolshoi Babylon shows the Russian ballet, as viewed during its angst-ridden 2013-14 season, weighed down by jealousy, envy, ambition and other base instincts. Other classical dance companies throughout history have been similarly plagued by scandals (prostitution, unsafe work environments, arbitrary hirings and firings and eating disorders leading to death, to name just a few) and so saying that ballet is ruthless and competitive – as well as scary in places – is nothing new. Distinguishing Bolshoi Babylon, however, is that it dares tread where no other ballet doc has gone before. 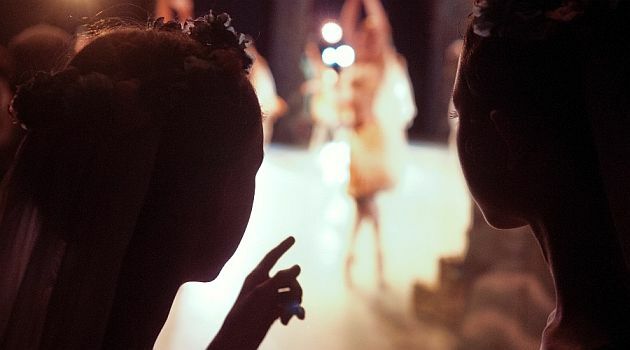 Light on pretty and investigative in nature, the film’s unfettered access to key backstage players presents first-hand testimonies that make all too real the harshness underlying the gracefulness of the ballet. 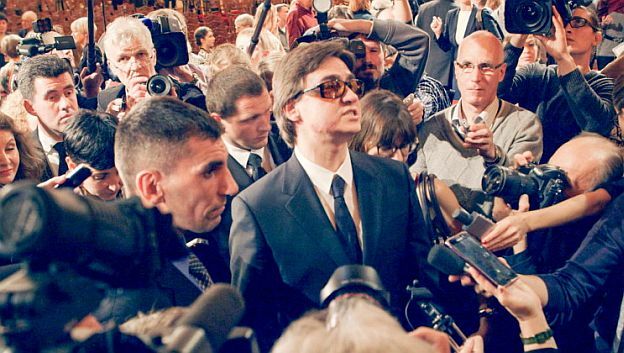 A scene from Bolshoi Babylon: Bolshoi artistic director Sergei Filin, post-attack, at a press conference. A former leading dancer at the Bolshoi who had been directing the famed dance company since 2011, Filin, then 42, had been waylaid near his Moscow home late at night by a masked assailant who tossed sulfuric acid in his face, disfiguring him and blinding him in one eye. Within weeks Bolshoi principal dancer, Pavel Dmitrichenko, was arrested and charged with having organized the attack. Born in 1984 into a family of artists, all members of the State Academic Folk Dance Ensemble under the direction of Igor Moiseyev, Dmitrichenko was sentenced to six years in prison while his accomplices, Yury Zarutsky, who threw the acid, and Andrei Lipatov, the getaway driver, got sentences of ten and four years, respectively. To this end, Bolshoi Babylon makes the argument that the ballet is symbolic of Russia itself. Unethical conduct within the Bolshoi is symptomatic of corruption within the state. People who either work or worship at the Bolshoi espouse this quasi-Shakespearean theory in the film’s opening scenes. Further bolstering the idea that the state and the stage are closely intertwined is hauntingly beautiful footage of dancers performing the 19th century classic, La Bayadère, interspliced with newsreel images of Russian tanks rolling into Ukraine and of president Vladimir Putin looking characteristically stern. It’s a predictable scenario, making spurious connections that are not credibly substantiated, and is one of the few grating moments in an otherwise captivating film. Oksana Yushko (and the Bolshoi corps) performing La Bayadère, in a scene from Bolshoi Babylon. Bolshoi Babylon’s clichéd portrait of Russia as a totalitarian dictatorship is undercut by the fact that the film only got made because Russian authorities gave its foreign filmmakers unprecedented entrée to the Bolshoi’s usually hidden corridors of power. These same authorities also granted access to important political and cultural figures, among them Prime Minister Dmitry Medvedev. and appeared to have turned a blind eye when disgruntled dancers like the outspoken Nikolai Tsiskaridze and the ballerinas Maria Alexandrova and Anastasia Meskova aired their grievances to these outsiders suddenly in their midst. Many in the film speak candidly about the fierce backstage politicking that no doubt led to the crime inflicted on Filin. This is where Bolshoi Babylon gets interesting. While clearly a primary character in the real-life Bolshoi drama, Filin does not emerge as the film’s hero. Characters within the organization champion his leadership. But there are just as many who suggest that Filin may have been the author of his own misfortune. Dmitrichenko had publicly accused Filin of taking bribes and trading roles for sexual favours, allegations the beleaguered artistic director staunchly refutes in the film. Yet, Filin’s own behaviour, as captured by Read’s sly and all-seeing camera, suggests a shady character.